A simple human interaction can be a rich lesson. I started the Exchange Project in 2010 as a unstructured and on-going exploration into informal education and tacit forms of knowing. Each chapter of the project emerges from casual dialogue with people I encounter, where conversation about some particular knowledge or skill we each possess opens up. The chapters may explore knowledge derived from personal experiences, observations, insights, intuition, information passed-down from previous generations, or habits particular to one’s life circumstances. My encounters then develop into 'lessons' and sharing of personal values around the particular knowledge or skill. comes to know, how such knowledge is shared and performed, as well as the mutual suspending of assumptions in order to arrive at mutual understanding. The exchange on my part differs from chapter to chapter, based on the specific interaction with my subject. I met Eric for the first time in an Engineering school in Hong Kong, and noticed a proud sign "Knowledge Manager" when I entered his office. This chapter naturally became an interview with Eric on the subject of Knowledge Management (with transcript below). 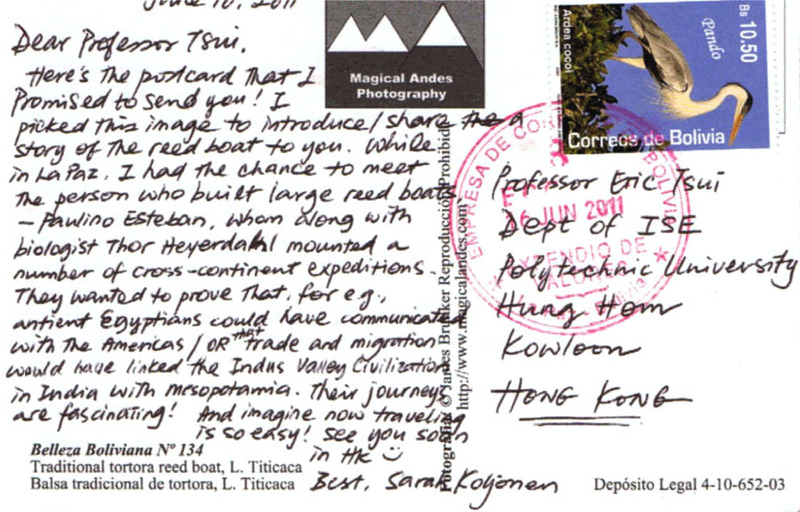 In exchange for the interview he gave, Eric requested from me a postcard from my next overseas trip. I took the opportunity to write about meeting Paulino Esteban when I was in Bolivia. Esteban is an Aymara Indian and a renown builder of reed boats, who sailed with Thor Heyerdahl across the Atlantic ocean on his reed ships Ra I and Ra II. Their expeditions proved that early civilizations could have sailed the oceans, communicated, and even traded using this ancient system of design. 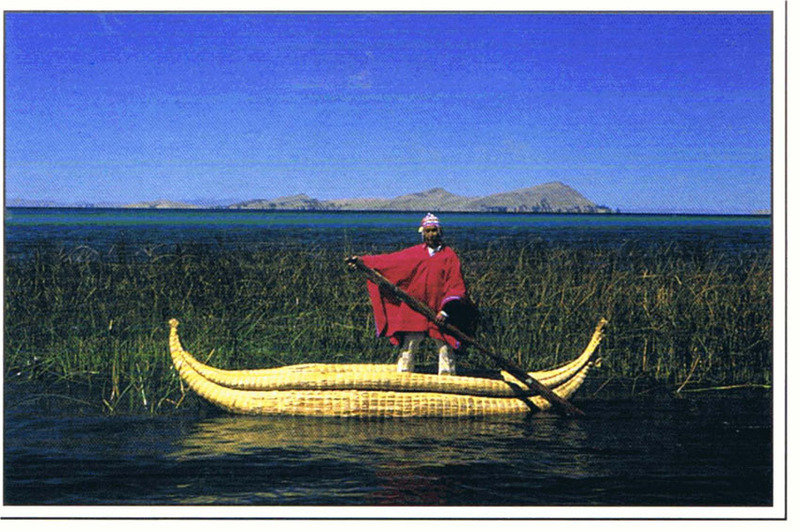 Esteban's knowledge of building reed boats is a form of weaving that may very soon be forgotten because it is based on oral tradition and memory. SLK: Professor Tsui, can you please tell me, what is Knowledge Management (KM)? ET: So in today’s society we are all, you know, I suppose knowledge workers, dealing with or confronted by a huge amount of information, so knowledge management came as an important area because it helps us to better identify the source of the information, and better organize the information, and how to structure and present information, as well as retrieve information in such a way that it can help us to excel. Now it’s not limited to oneself, of course, because in the KM field, we also cover about how to foster effective and sustainable collaboration with other people, because you know, many people start to realize that knowledge is only socially constructed, knowledge is not an entity where you can capture it in a bottle and store it away. Knowledge has a time-step. ET: That’s with anything, right? So there’s a time factor with it. So KM is about better management, sourcing, governance of all this information, and using effectively for individuals, for teams, for organizations, for cities, and even for societies. SLK: Um hm. What kind of level do you think your work is based on? ET: Well, there are two ways to answer it. If I refer to our centre, then our work is concentrated in areas like the studying of organizational culture, because very often, we realize that it’s the people’s mentality, people’s readiness to take on KM that is more important that what KM really is and what you’re going to introduce to them. SLK: So KM would be something that they would apply to, it’s not something that already exists that you give a name to? ET: KM is something, some techniques that they may like to pick up, it may be some process change where they may need to adapt to, and therefore the human attitude, the culture, the norms come into play. Right? And coming back to my point, our second research area is on KM technologies, which obviously is my core interest. A third area is on intellectual capital, which is trying to review, report and measure the value of creation of some hidden potential in organizations. And this is where, you know, the famous professor Leif Edvinsson came in. Now, on a personal level, I am conducting research and am very passionate in a number of areas in KM. One is on Personal KM, which is better management and sourcing of all the information that come through my desk, and be able to organize it and treat it effectively whenever I need to, or whenever my friends need to. SLK: Can you give an example of how you do that? ET: Yeah. I’m using a combination of example Google tools, Yahoo, and a whole range of information management tools that are available on the Internet, to help me to identify good trustworthy sources of information. I’ve also developed a co-learning environment on the Internet principally by a set of Google tools, to co-learn with my students, graduates and other professionals, as well as other lecturers. SLK: To ‘co-learn’ as in it’s like a web or blog site where everybody can contribute? ET: Correct. It’s more like RSS feeds where there are articles that come in, then together fuse those articles and just focus on those that are value-add to our study and our work, and then we further discuss this and relate that to our lectures, seminars, to conferences that we have attended. So, it’s been quite well. SLK: Um hm. So it’s filtering information first. ET: Correct. But everyone can filter, not just a one too many steps, so even a student can filter for me. SLK: So it’s almost like a Wiki type of thing? ET: Yes yes we also use Wiki but in a different context. Yes I think for this concision you can consider this to be a collaborative Wiki. Right, but it’s a Wiki with automatic updates because there’s external information properly aggregated and filtered to come in. ET: Right. And then the third area of my interest is on communities. Community is a term that is loosely defined to equate the gathering of like-minded people—gathering physically face to face, or online, or a combination of those—and they work towards a common goal, and they have shared identity or goals. Community is, I think it is one of the most effective ways for on-going sharing of tacit knowledge, which is knowledge that is up here [stored in memory] and not things that are already written up. SLK: And of course my goal is focusing here on informal education and spreading it this way by sharing tacit knowledge as a form of education. ET: I think this is extremely valuable, and you are doing precisely the right thing. Because for explicit knowledge we’ve got plenty although it’s never enough, we’ve got plenty of books in the library, we have online material, we have lots of publications that people can look up and read. But for tacit knowledge, in KM we always site this famous saying by one of the professors, Plotinus I think is the name, but Dave Snowden also talks about this. We always know a lot more than what we can say, and we can say a lot more than we can write. SLK: We can say a lot more than we can write, right. ET: Okay, so you’ve got it. So that means that what you’ve written, what anyone has written is only the tip of the iceberg of what people really know. So you are focusing at the right place to get this, because this is not something that you get from a book. ET: There are plenty of books already. SLK: Books that have been referencing other references. ET: Correct. If you want to do it well maybe here you may add some scripts or words to look for further studies in this particular area, there are some seminal work and here are some of them if you want to follow up on them. SLK: Um hm, I see. Then I guess from here on… I also didn’t want it to seem too much like e-learning, you know what they put on Youtube, etc. SLK: So how can I manage this kind of information? For me it’s the aesthetic, and having it on my website separate from Youtube and somewhat separate from Vimeo, although now it’s Vimeo, how to I separate it from other qualities of people sharing e-classes online? ET: Well okay. I don’t know if your thinking has surpassed this particular area or not, to me you need to think seriously about the pitch, what is the ultimate contribution of attracting people to come to this website. Is it just a bunch of Vimeos and videos? It sounds like it isn’t, because if that’s the case you might as well put it on Youtube or Vimeo and just let people search in the pool among a pool of other things, right? So what is that ultimate thing that you’re aiming for that this ‘Exhange’ page will bring to people that other places cannot be? I’ll give you a few examples. For example if you go to this one called, let me see, I’ll think of the name later. There’s one that acts as a filter. Perhaps if you want to know everything about playing the violin, or you want to know everything about this person who is quite well-known in this particular area, that website will gather together all the information about that art, about that musical instrument, about how to play it, as well as that person, and give you that focus, that ‘entry point’ to that knowledge. At the moment, I think you need to think harder about if ‘An Exchange’ as a page, as a filter, as a lens, would it want to go that direction, what is it you’re delivering that otherwise other websites do not offer. SLK: For me I’m putting this in a fine arts framework, instead of a come-let’s-learn-something-on-Youtube framework. In a way I do want to challenge the art field that artists do not always have the autonomy, that artists are the genius who hides in the studio and produces work, but that an artist as somebody who sources information from other people, and takes that back to a fine arts setting, which ever that will be redefined as. Perhaps then putting these onto my website, and perhaps I would have my own links where I would like to compare my work to, would be a kind of filtering. ET: Okay, I have some further ideas then. If we just focus on this one—learning how to play the D minor on the violin—then you’ll have the page with just that, learning how to play the D minor on the violin, and then after this video, you have a few questions saying look, this is what I’ve learned, but these are some of the things I’m still having difficulties or need far more practice in order to learn. Now has anyone came across that difficulty before, can you shed more light about that, then you an entice people to upload more videos, or respond to your comment. Then over time hopefully you will have built up some responses, good responses, which some of those you will action on, and perhaps after some time, you can express again how you have actually absorbed through these external input in order to improve. Then maybe you can demonstrate that on a second video on that topic. SLK: Ah, so further improving on the skill. ET: Yes, you see so people can trace that there’s a chronological order depicting the learning process and learning behavior, with some definitive improvement in learning outcome. SLK: Then I’m thinking that with this kind of online learning, there’s really no end to it, we can go into a live web video chat scenario where people can be giving tutorials… so there’s really no end point to how you can improve your skill, as far as online learning. ET: Well the Internet is perpetual, the only thing that I can offer based on that comment is there is a concept in KM called a Jam. A Jam is for example you set a time of uh, in the past we’ve done it with a week, with 72 hours, where together you invite a thousand people to Jam on a particular topic and you get as many ideas as possible and then you analyze it. After 72 hours you stop. Anything that comes in after that you don’t count. So you can Jam it. Look, let’s Jam for the next 72 hours what are the responses, what are the things you can help to improve on my violin skills? SLK: Okay, I like that idea. Well first I’ll have to increase my web traffic in order to get enough people to jam together. ET: Yup. That seems to work quite well in organizations, because in organizations people always use the excuse that ‘I don’t have the time’, or ‘I’m terribly busy’, ‘I don’t have a PC’ and things like that. Now you can say that, look, now you’re not suppressed by your manager, you can use it from your home PC and access it, but we’ll give you 72 hours so jam and voice whatever you want to voice out. In Hong Kong that seems to tip the balance on the normal organizational behavior. SLK: I see. I find that interesting, I’ll look into that. Perhaps that can even apply back into an exhibition setting where I can set up a screen in the exhibition hall where the jamming can happen. ET: Yes. And the other thought is what I’ve shared with you before, over time I suspect you will accumulate a fair amount of videos, so perhaps you will start to look into a way to more appropriately cluster together the different videos, perhaps based on topics, perhaps based on themes, perhaps based on people, so that together they present a visually expressive protocol for your visitors to see, rather than you know, the orderly way of just sequencing them and placing them page by page. SLK: Can you think of some website that already have very good ways of organizing lots of information creatively? ET: Yes, you can go to www.thebrain.com. Thebrain.com is a software that part of it you can use it for personal reasons then get it for free. Thebrain is a software where you can mark a website, and you can automatically cluster together related pages. Whenever you click on a particular note, you will re-orientate the rest of the page, based on the linkages, the conceptual, the cause and relationships between this page and others. ET: That’s only one way, yes it’s a bit of a wow effect. SLK: But how does it guide you to the next? By keyword? ET: You link that manually. And obviously there are some more advanced software such relationships to be automatically discovered and you can review and rectify those relationships. But thebrain, as far as I know, because it is sort of an entry-level software to this, it is manually created as far as those links are concerned. SLK: How can somebody like my very limited skills do this? ET: I think if you can tolerate reading four or five pages of instructions you should be able to do it. ET: These days, let’s put it this way. Computer science is becoming more and more human. If a piece of software, a piece of instruction is aimed for the masters to take up, and it makes it so difficult that [lay] people cannot pick up, there’s no future with this software. ET: No no. I haven’t seen a manual that thick for about 10 years. SLK: (laugh) I just threw out a bunch the other day. SLK: Right, they’re like telephone books that go under your pot. Well then, I have a lot more ideas on where I can take this. ET: I can continue to check this page on the public domain, is that right? SLK: Yes it is in the public domain. Would you mind if edited our video for this site? ET: Wonderful, wonderful. But would you also allow people to comment on this page? At the moment I don't see anything. It’s not a Wordpress is it? SLK: No it’s not. It’s just a very basic one. ET: It’s a ‘one-to-many’, just a webpage. SLK: I did think of using Wordpress actually, but from the example web pages I have seen, it seems to be more like a blog site… but I’ll look more into it. ET: Right, okay. But assume that you haven’t put too much in here, at the moment there’s not much to loose if soon you go with one where people can be more interactive. SLK: Yes I probably would like to do that soon too, because back in the main page right now, my work has change pretty rapidly, like from 2006, I’ve still being doing a lot of paintings, printmaking and drawings, so they didn’t really need a blog site or commentary space. And then the work changed into a more system-based rules in drawings where I created my own drawing tools to make these pieces, and the drawing tools were based off the measurement of a piece of driftwood. SLK: Spins like those spiralgraph toys. ET: Okay okay, it’s like a large scale of it! SLK: Yes really large scale, I was crawling on the floor to do this. It was only quite recently that I’ve been reaching out to more people to contribute to my work. So I think Wordpress would be something that I’ll need quite soon. ET: And all this is part of your study? Or are they part of your own freelance work? Or both? SLK: This 2002-2006 was mainly from my undergraduate level. And from here on it’s my graduate level work. ET: Wonderful, you keep a tally of everything you’ve done. SLK: That’s why I love having a website, you won’t have to go through a big portfolio book to find out the size of paintings, etc. Go read the site and you’ll find out on your own, and it’s my visual archive. And here it dates back to pre-undergraduate work too. ET: So how much space are you consuming at the moment, do you know? ET: So you just use an ISP to host all of it. A service provider. SLK: Yes yes. And most of them are jpegs so they don’t take up too much space. SLK: Thank you. That’s why as this is accumulating, I see more and more language/ writing, video and demos, etc, coming in to the work, so wondering how I should manage this information to share with others was when I thought that meeting you would be very beneficial. ET: I know another designer he’s an architect but he’s a designer. He lives in New Zealand. So when the opportunity exists I will link you up with him. He always talks about design knowledge. Rui Martins. SLK: Thank you! He has a website too I guess? ET: I suppose so. Rui- it’s French. He’s a good friend of mine. Okay, I think we should take a photo together.